Pre and post rental inspection is a fundamental part of the hire procedure. It is not only the responsibility of both the renter and owner to assess potential damage during the rental period, but also an important record of condition and maintenance. For any pre and post rental inspection, it is therefore important to have the best management tool and checklist available. Today, the market leader is paperless inspection applications. As well as providing a dynamic tailored software package for easy integration into your business, digital inspection applications are a straightforward way of taking your business digital. 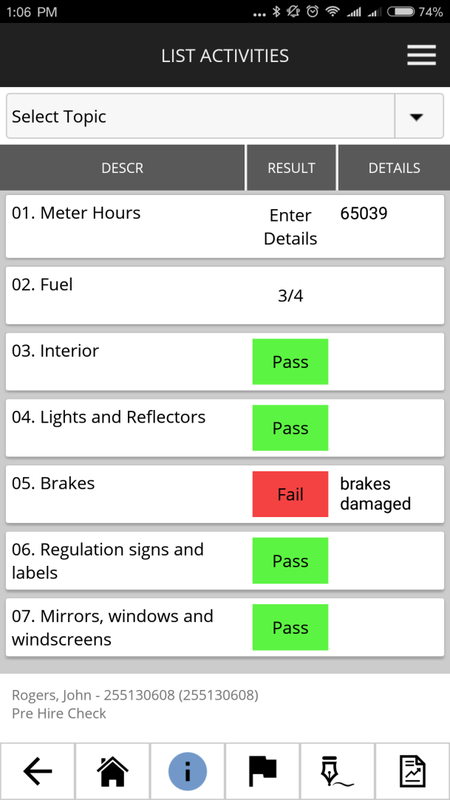 Customisable checklists on your smartphone or tablet device means inspectors can quickly and efficiently carry out pre and post rental inspections and improve efficiency. Whilst this simple 5 step routine can seem quick in theory, that sometimes isn’t the case when paper is involved. Paper checklists are slowing down inspections with a tendency to get lost, damaged, leave too much to interpretation and be a logistical nightmare for filing. Why waste time with this process whilst your customer is eager to hit the Great Ocean Road or get the fleet on the road? Paperless inspection applications are proving to be a modern answer. Features of the common mobile device are adeptly suited to use in inspection. The camera can be used to take photos of damage, which can also be annotated to highlight the extent of damage for later reference. The touchscreen can provide quick standardised response checklists for a faster process. The GPS timestamp can effortlessly record which depot the vehicle or asset was taken out from. There are numerous ways in which the mobile device shows itself as a logical companion to pre and post rental inspection staff. Where paperless inspection applications really confirm their worth in the inspection process is after the inspection is complete. Paperless apps means every report is automatically filed on a private server or the cloud (SaaS), with trigger notifications and automatic response. No need for filing or input of results onto a database – that entire procedure of the pre and post rental inspection process is eliminated. That also means the client can be the emailed inspection report as soon as it’s complete and management can see an overview of your business. Maintenance can get trigger notifications as soon as something is failed on inspection so they know immediately what needs to be fixed and management can get notifications telling them what they need to replace. By automating this, pre and post rental inspection can be more efficient and more accurate. If you’re thinking of providing the best service to businesses or individual consumers, you need to ensure you have the best processes and methods in place. No one benefits from an old and ineffective system, business growth and customer happiness will most likely be limited if this is the case. The best solution? Go paperless with your pre and post rental inspection.